Chef Mac Russell has owned Shindigs, a popular Birmingham food truck, for several years. But he said his new Forest Park restaurant, Whistling Table, is giving him the opportunity to participate in Restaurant Week for the first time. Journal photos by Jordan Wald. Since the 2017 edition of Birmingham Restaurant Week, the city has been on a pretty cool ride, food-wise. Frank Stitt’s Highlands Bar and Grill and the restaurant’s pastry chef, Dolester Miles, won James Beard Foundation Awards. Birmingham made Zagat’s list of the 30 Most Exciting Food Cities in America and was touted by Wine Enthusiast as a place for “top tier drinking and dining.” In May, TV chef Andrew Zimmern was in town to film an episode of “The Zimmern List,” his new Travel Channel series. The city’s culinary street cred is on the rise across the United States – but that’s no surprise to people such as James Little, REV Birmingham district manager and the person who founded Birmingham Restaurant Week in 2010. BRW 2018 runs Aug. 10-19. The event gives diners budget-friendly opportunities to revisit favorite restaurants or try out new ones. More than 70 restaurants already have signed up to participate with special lunch or dinner prix-fixe menus for $10, $15, $20, $30 or $40 per person. 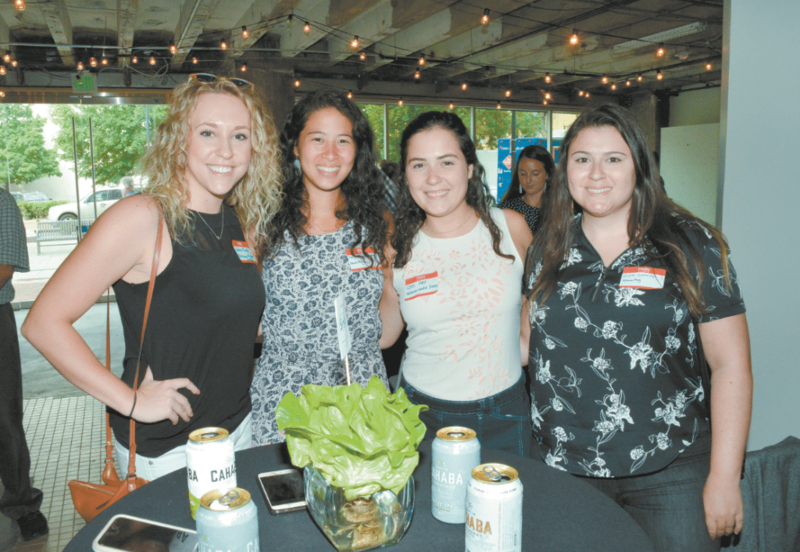 A July 23 BRW preview party at the Pizitz Food Hall drew a lively mix of chefs, restaurateurs, media folks and others eager for a taste of the event. On one side of the room, chef Mac Russell painstakingly plated up a beautiful bowl of rabbit agnolotti with parmesan brodo. Russell has owned Shindigs, a popular Birmingham food truck, for several years. But he said his new Forest Park restaurant, Whistling Table, is giving him the opportunity to participate in Restaurant Week for the first time. Russell’s agnolotti joined farmers market pappardelle from Vino in Mountain Brook’s English Village, a big plate of ribs from Dreamland Bar-B-Que, pho – Vietnamese rice noodle soup – from Pho Pho Vietnamese and Sushi Bar, and other Instagram-worthy creations on a display table. Those dishes were shown off just to give those who attended the party an idea of what to expect on BRW menus, but another table held a colorful array of food for guests to sample. Dre Foster, chef and owner of The Preservery Bham, made smoked gouda grits fritters with spicy apple butter, pimento cheese with celery pickles, pretty pink deviled eggs and crudités with her house Caesar dressing. “We’re at the Pizitz Food Hall’s Reveal Kitchen now and will be participating in Restaurant Week,” Foster said. 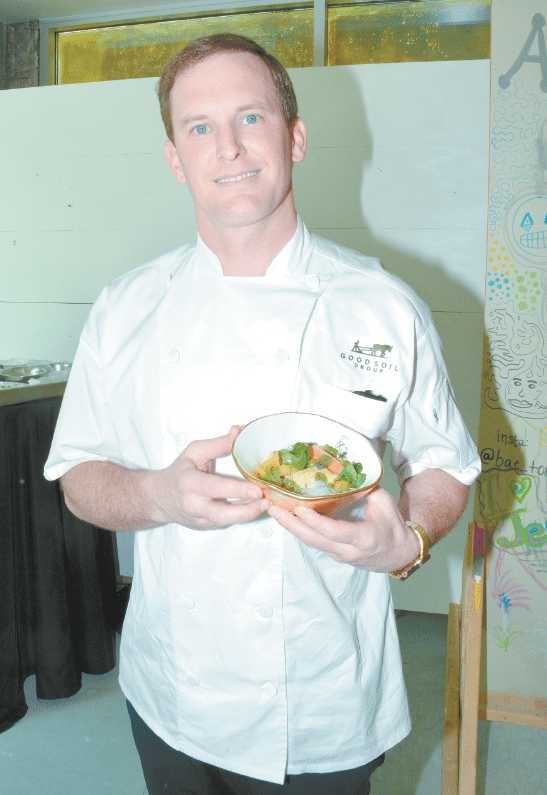 Chef Ben Vaughn will be another BRW first-timer for a very good reason: His Root to Tail restaurant in English Village wasn’t open in time for him to take part in last year’s event. “Summertime can be difficult in Birmingham, and this event brings in people who may not be your typical diners,” Vaughn said. Next year, he may have more than one restaurant in the BRW lineup. Vaughn said he’s getting ready to open Libertines Craft Pizza Co. in the old Cosmo’s Pizza spot at Birmingham’s Five Points. According to event planners, BRW restaurants typically see a 20 percent average increase in sales compared to a normal week. The 2017 Winter and Summer Restaurant Weeks resulted in 33,500 BRW meals sold, totaling $4.5 million in gross receipts during the event. Many of the restaurants that participate in BRW are clients of REV Birmingham’s Urban Food Project, an initiative that aims to build a strong local food economy and to increase access to fresh, nutritious food. UFP helps local restaurants, corner store owners and farmers in producing, selling, distributing and promoting locally sourced ingredients. This distribution gives more quality food options to the approximately 88,000 Birmingham residents who live in food deserts – urban areas where it’s hard to buy high-quality or affordable fresh food. Regions Bank is the presenting sponsor for Birmingham Restaurant Week. This is the seventh year the Birmingham-based bank has served in that role. A July 23 BRW preview party at the Pizitz Food Hall drew a lively mix of chefs, restaurateurs, media folks and others eager for a taste of the event. From left, Katie Rush, Tara Massouleh, Sara Dyer and Nicole Gerrity. In addition to 10 days of great dining deals, Birmingham Restaurant Week has several special events. Kicking off the fun is a Harvest Brunch on Aug. 11 at Social Venture, 5529 First Ave. S in Woodlawn. More than 20 restaurants will serve brunch bites along with mimosas and Bloody Marys. Trip Cobb, Alabama sales manager for Tito’s Handmade Vodka, said Tito’s will have a “huge build-your-own Bloody Mary bar” at the brunch. “We’ll also be doing specialty cocktails featured at some of the participating restaurants,” Cobb said. Cobb drew preview party guests to his table by mixing up Birmingham Mules – drinks made with Buffalo Rock ginger ale – Chilton County peaches, homemade peach puree and, of course, Tito’s Handmade Vodka. Those who sign up for another BRW special event will have a chance to work off as well as take in some calories. Birmingham Tasting Tours will lead a Magic City Eats bike tour from 3-5 p.m. Aug. 11. Those who buy tickets will hop on green Zyp bikes and pedal off to Whistling Table, Slice in Birmingham’s Lakeview District, and the new Blueprint on 3rd at Pepper Place for chef-curated tastings. Lucky Cat Rolled Creams in Homewood will be showing off its sweet treats. Owner Hannah Slamen said she’ll offer five or six rolls of ice cream in different flavors and with toppings. Lucky Cat, which opened in February, is another BRW newbie. BRW organizers said they expect close to 80 participating restaurants this year. Those already singed up are 5 Point Public House Oyster Bar, Avondale Common House & Distillery, Bartaco, Bistro 218, Bottega Café, Bottega Dining Room, Brennan’s Irish Pub, Cantina, Carlile’s BBQ, Chez Lulu, Customs Café, Dreamland BBQ, Fero, Firebirds Wood Fired Grill, Flemings Prime Steakhouse, FLIP Burger Boutique, Grille 29, Habitat Feed & Social, Jojo’s on Broadway, Little Italy, Lucky Cat Rolled Creams, Michael’s Restaurant, Mason Dixon Bakery, Ocean, Oscar’s at the Museum, Pazzo Big Slice Pizza, Perry’s Steakhouse, Pho Pho Vietnamese and Sushi Bar, Rojo, Root to Tail, Roots & Revelry, Rusty’s BBQ, Sammy’s Sandwich Shop, Satterfield’s, Seasons 52, Sky Castle, Slice, Taco Morro Loco, Taj India, The Cowfish, The Craft Burger, The Gardens Café, The Grill at Iron City, The Wine Loft, The Yard, Vino and Whistling Table. For a list of participating restaurants, menus, special events and more information, visit bhamrestaurantweek.com. BRW also is active on Facebook, Instagram, Twitter and Snapchat and can be found @bhamrestweek. The event’s official hashtag is #BRW2018. The BRW “Free Food Friday” contest on Facebook will take place again, allowing fans to receive gift certificates to a BRW-participating restaurant each Friday.